Check out one of the horse book reviews! Read to find out what happens! While I think this is a wonderful book, I think the other two books in this series are even better and I'm surprised they aren't mentioned on this website. They are Macadoo of the Maury River, which is about a Belgian Draft horse, and Dante of the Maury River, about a racehorse. PS. I really hope the author writes more books in this series! It's a great book about a Belgian stallion. When he is young his mother tells him that helping is the " Belgian way" . He then spends his life helping -whether it's a butterfly or an orphaned boy or disabled kids at a therapeutic riding stable. It gets complicated, but it's a great, heartwarming book. Please read it. This is such a good horse book. It is one of my faves. Horse lovers need to read this! This book is one of my faves. YOU should read it next! I read this book for a book report. I was first confused about who is telling the story. I later found out it was the horse. Wonderful book, just four stars because it's a little bit confusing in some parts. Sad when he gets cancer! Alright book-it's just that there are no such thing as an albino horse that is alive! What was the title of the chapter? What was the title of the chapter that you were on before you lost it? I haven't read all of it but i lost the book so can anyone tell me what happens? I don't know it didn't have that much action and was kind of boring so i didn't really like it. it didn't pull me in and make me want to read more so i say it is okay but NOT appealing. Chancey is an albino Appaloosa gelding. 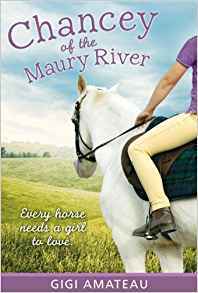 When his owner (who still grieves from Chancey's mother's death) goes broke, she has to sell him and his fellow equines to Maury River Stables. There, he meets Claire, a young girl who's parents are divorced and is still trying to recover. The two working together as a team, as well as being part of a therapeutic program at Maury River Stables. This book is wonderfully written, with rich definition and story telling by Gigi Amateau.